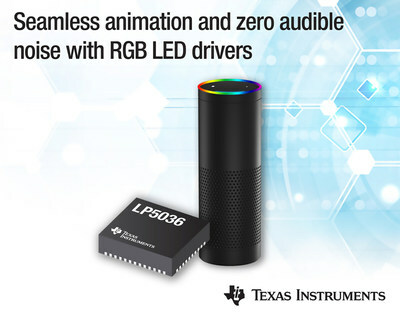 DALLAS, Nov. 28, 2018 — (PRNewswire) — Texas Instruments (TI) (NASDAQ: TXN) today introduced a new family of LED drivers with integrated, independent color mixing, brightness control and a power-saving mode. The LP5018, LP5024, LP5030 and LP5036 enable smooth, vivid color and reduce system power consumption. For more information, see www.ti.com/lp5018-pr, www.ti.com/lp5024-pr, www.ti.com/lp5030-pr and www.ti.com/lp5036-pr. The devices are the industry's first to offer a 29-kHz dimming frequency, above human-audible range, to help designers of applications that use a human-machine interface, such as portable electronics, building automation and appliances, eliminate the noise typically heard when dimming lights. Additionally, designers can achieve smoother color and brightness-level adjustments compared to standard pulse-width modulation (PWM) solutions, by taking advantage of the devices' integrated 12-bit PWM generator. High-resolution PWM dimming: The devices in TI's LP50xx family integrate a 12-bit PWM generator that operates above a human-audible frequency, at 29 kHz per channel, enabling smooth, vivid color with zero audible noise. Ultra-low quiescent current: An integrated power-saving mode dramatically reduces power consumption to as low as 0.01 mA from the typical 9 mA offered in existing devices, improving total system efficiency in standby mode. Multichannel options: 18-, 24-, 30- and 36-channel options provide independent color mixing and brightness control, while three integrated, programmable banks enable simplified software coding and ease of design. Designers can download LP50xx graphical user interface software to easily configure the LP5018, LP5024, LP5030 and LP5036 LED drivers. Engineers can jump-start their designs with the LP5024EVM and LP5036EVM evaluation modules. See how to implement sophisticated lighting patterns for end equipments with a constant voltage supply using the " Various LED Ring Lighting Patterns" reference design. The design utilizes two LP5024 LED drivers to dynamically adjust brightness without impacting contrast ratios in ambient lighting situations. The LP5018 and LP5024 LED drivers are available now in the TI store. Additionally, preproduction samples of the LP5030 and LP5036 are available now in the TI store. The table below lists pricing and package type. These new LED drivers with integrated PWM join TI's extensive LED driver integrated circuit (IC) product portfolio, design tools, and technical resources that can help electronics designers add innovative lighting features to their systems. Read the blog post, " Using an RGBW LED driver to elevate LED human machine interface designs." Watch the video, " LP50X LED drivers: achieve optimal color and brightness with zero audible noise." Download the LP5024 and LP5018 PSpice transient model.